Matthew Libatique, ASC has completed his month-long tour of duty as the guest curator of the ASC’s Instagram account and passed the torch to Joseph Labisi, ASC, who will be hosting the page through the month of May. The cinematographer is best-known for his award-winning work in commercials and music videos. Eric Steelberg, ASC coordinates the Society's account and invites a new ASC member to take over each month, allowing them to directly discuss their inspirations and experiences with page followers. “Keep ya heads up!! !,” Libatique posted on his final day, also thanking Steelberg and the ASC for the opportunity to share his thoughts and experiences with the Society’s 123,000 Instagram followers. “Since the ASC is about the advancement of our craft and supporting the next generation of cinematic story tellers I wanted the first image I share to be of my daughter, Mia Michele,” he wrote. “This was Mimi’s first time being on set and touching a motion picture camera. This moment gave me a joy I can’t really express in words. Having Mimi and mommy (who is half Colombian and half Italian) on set for our friend @Jasonderulo’s music video — celebrating the colors of the world made the day feel more like a gift than work. “As a cinematographer I always felt I had the best job in the world, it was only when my daughter was born did I realize I actually had the two best jobs In the world — the first is being a father. Labisi then wrote of the many cinematographers who helped inspire and educate him, including his time spent as an intern working for ASC great Allen Daviau: “Through my lighting instructor Sean Mitchell [at Academy of Art University], I got an introduction to Allen Daviau. Allen would have me on set as his intern as I would meter for him while he educated me in a truly effortless way. “Allen has a encyclopedia (or a Google for the younger generation) capacity to remember everything he did in his career — vividly. I would mention a shot from a film he did and he would rattle off the lens, time of light, lighting he used, stocks etc. It was amazing! He agreed to take me on as long as I did the same for others when the time came. Something I’ve continued to do throughout my career. He also introduced me to my first crew that would support me in my early days. Gaffers @yankeepapa13 @billmayberry, and key grip @bobmayberry who basically taught me as they supported my earliest jobs. Something I will always be grateful for. Be sure to log in and follow Labisi’s story as it unfolds. 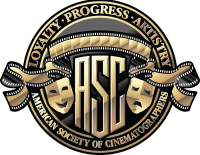 The ASC Instgram page has been recently moderated by members including, Christopher Probst Dana Gonzales, David Klein, Dan Mindel, Reed Morano, Rachel Morrison, Phedon Papamichel, James Neihouse and Jo Willems.